In 10 years of traveling, I’ve always thought that I had to trek to places like Patagonia and New Zealand to seek outdoor adventure. I didn’t realize I could find it close to home in places like Chattanooga. Chattanooga (or ‘Nooga’ as locals call it) is located in the rugged mountains of southeast Tennessee and is the state’s fourth largest city. 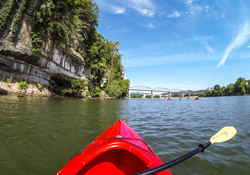 Its downtown along the Tennessee River is continually being revitalized, but I visited for the nearby hiking, rock climbing, and whitewater rafting, among other exciting outdoor sports. 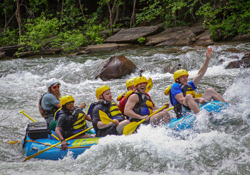 This is whitewater rafting on the Ocoee River with Outdoor Adventure Rafting aka O.A.R. Before getting on the water our group of six took a safety class with our guide and learned that the Ocoee River was actually used during the 1996 Atlanta Summer Olympics. During our trip we spent about 3 hours paddling down the Ocoee attacking up to Class IV rapids. Every time we conquered a huge rapid, we bonded as a team and throughout the trip kept laughing whenever rapids drenched us with cold water or someone almost fell in. During less intense moments, I enjoyed the fresh air and mountainous scenery of the surrounding Cherokee National Forest. 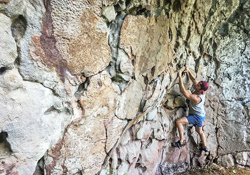 Rock climbers travel to Chattanooga every summer because the city and its surrounding areas are loaded with sandstone bluffs and boulders suitable for all types of climbing. One of the most popular climbing spots is Stone Fort Bouldering (aka ‘Little Rock City’), just 30 minutes north of downtown. This boulder field is hidden in a forest alongside the Montlake Golf Club and packed with rock formations for climbers of all levels of experience. As an intermediate climber, I spent a few hours bouldering while also enjoying the peaceful and quiet forest atmosphere. Little Rock City felt like a DIY climber’s playground. You can take it easy by relaxing and watching fellow climbers, get in a challenging and sweat inducing total body workout, or find a happy medium. Just 30 minutes south of Chattanooga in Georgia is Lookout Mountain Hang Gliding. This adventure was one of my favorite ways to take in the stunning landscape of the South and required no prior hang gliding experience. All we had to do was show up, fill out paperwork, watch a safety video, strap in with our professional and hang on for the ride. As a tandem rider, an airplane towed our hang glide up to 3,000 feet where we were then disconnected. For around 10 minutes, my instructor and I glided through the sky enjoying the views of the rolling mountains and valleys. Although I went into it scared, it was actually an incredibly peaceful way to experience the outdoors. After watching several of us glide, someone in my group who wasn’t going to do it changed his mind and said it wasn’t scary at all. I spent my first morning in Nooga kayaking on the Tennessee River through Outdoor Chattanooga. The best part about my experience was enjoying the city’s riverfront views from the water. From Renaissance Park we paddled upstream under the John Ross and Walnut Street Bridges and got an up-close look at their concrete arches and blue steel trusses. Next, we stopped to examine the architecture of the Hunter Museum of American Art that sits on top of a beautiful 80-foot sandstone bluff. We later spotted a Great-blue Heron as we paddled north alongside Audubon Island, an 18.8-acre wildlife sanctuary in the middle of the Tennessee River. 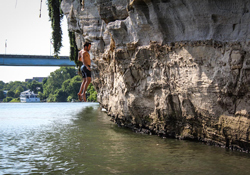 Before traveling to Thailand, I had never heard of deep water soloing — rock climbing and cliff jumping into water — and hadn’t seen it in the States. When I learned on my kayaking trip that climbers actually go deep water soloing on the bluff under the Hunter Museum of American Art, I had to do it. After getting in the water at the base of the bluff, I climbed along its edge until jumping back in the Tennessee River. The easiest way to access the bluff is definitely by kayak, but if you don’t have one, just ask the staff at The Crash Pad for tips on getting there by foot. 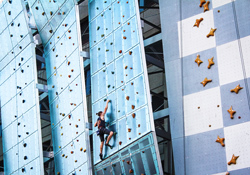 In addition to climbing outdoors in nature, High Point Climbing and Fitness has 30,000 square feet of indoor and outdoor climbing space. I started off in the bouldering areas and on walls with auto belay systems to warm up. A few local members then offered their assistance in the top roping areas since I needed a certified belayer. While I was climbing with one of these members, he told me rock climbing is a go to sport for a lot of young professionals in Chattanooga. He commonly spends weeknights after work meeting up with friends at the gym and many of them go on climbing excursions over weekends. In 1928, a local outdoor adventurer named Leo Lambert discovered a 145-foot waterfall while exploring the caves under Lookout Mountain. He named the falls after his wife Ruby. For roughly an hour, our tour guide led us through narrow passages that were often lit by neon red and blue spotlights fit for a dance club. 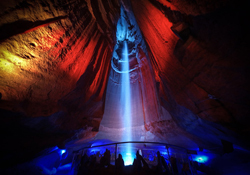 When we arrived to Ruby Falls 1,120 feet below ground, I was surprised that we experienced the falls by watching a music and colorful light show. Although it was somewhat cheesy, Ruby Falls was still one of my favorite Chattanooga adventures because of its unique story and beauty. The Tennessee Aquarium is located in the center of downtown Chattanooga on the Tennessee River. 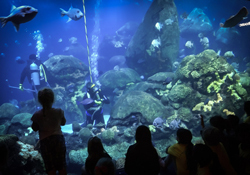 For locals, the aquarium is much more than just a collection of wildlife exhibits. 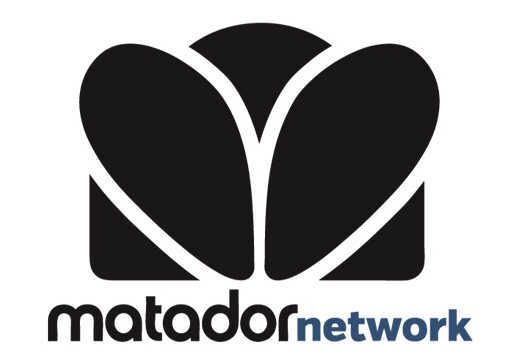 They credit it as being one of the main building blocks for the city’s revitalization and economic development since the early 1990s. The Tennessee Aquarium itself is divided into two buildings — River Journey and Ocean Journey. The highlight during my tour was watching the joy on all the kids’ faces as they checked out the exhibits and interacted with animals. I was also happy to learn that the aquarium actively works to preserve and restore biodiversity in Tennessee and beyond. 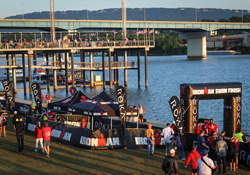 I was in town for the Ironman 70.3 Chattanooga event and woke up early to check it out at the swimming and bike transition on the Tennessee River. From the moment the first swimmer exited the water until the last, hundreds of people were lined up along the riverfront to cheer on family, friends, and strangers. When I headed back to the finish line later in the afternoon, I was impressed that the crowds had grown along the course throughout the day. While I Snapchatted athletes at the finish line, one man described the event as the most beautiful triathlon course he’s competed on saying he loved racing across Chattanooga’s rivers, mountains, and city terrain.